Are you all dressed up for Easter? we have started our Easter decor. in the kitchen besides the center of the island. they look so cute here with the canisters. my love for making chocolates. and they said they were no longer for sale. to try and take a bite. area. It accents whatever is on display so well. that my friend hand carried home for me from Los Angeles. bunnies were always my favorite on Easter morning. 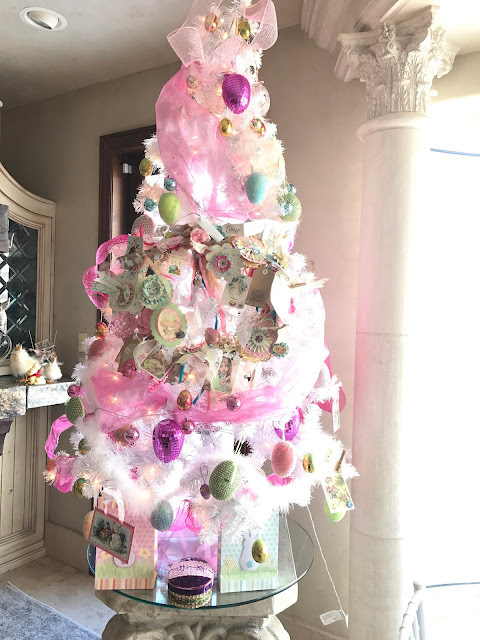 an Easter tree to grace the kitchen. center point of the tree. I looked last year, but didn't find anything. in case I was too late last year. 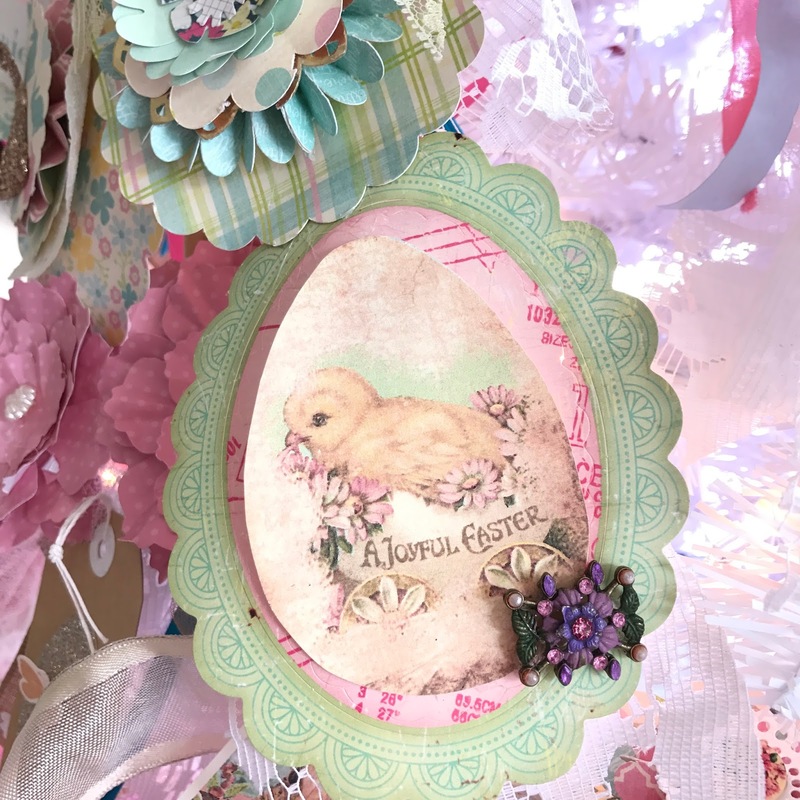 and a little Easter bowl accents them. and he quite charms me! 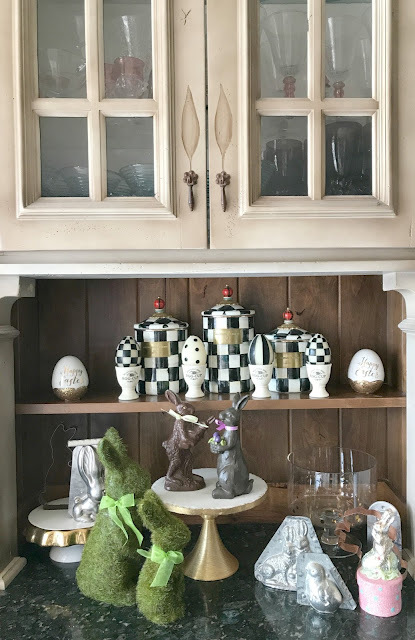 Thanks for coming to visit to see my Easter kitchen. I hope you are having fun decorating too. You....YOU!!!!! Girl, you have a beautiful kitchen, and I always enjoy touring it! You have lots of space in which to create wonderful little vignettes, and you always come through with lots of eye candy. N-I-C-E!!! You know me - I'm a lot like you - loving all kinds of eye candy! 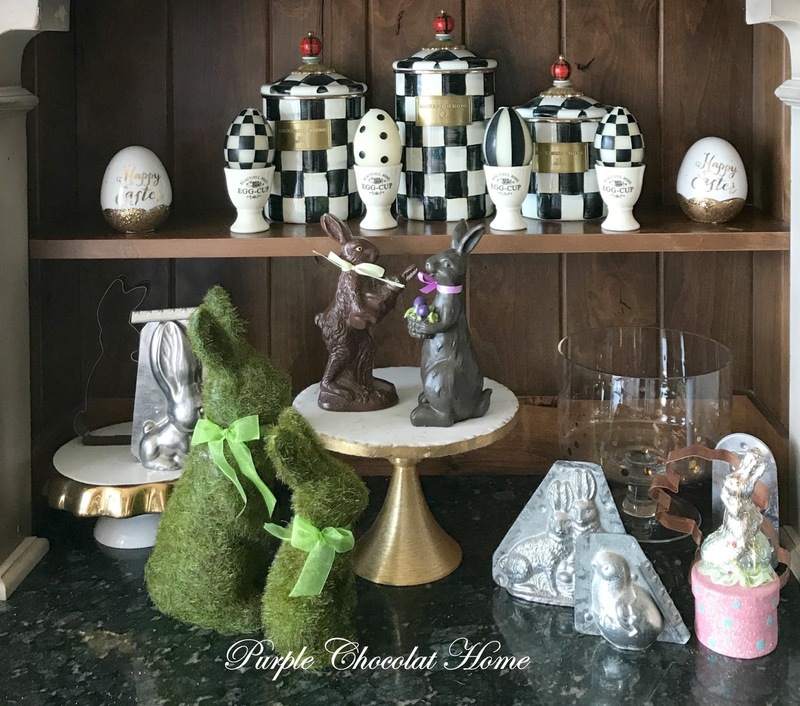 Oh I love the bunny teapot Jackie, and of course your kitchen all looks fabulous decked out with chocolate bunnies and MKC! Your Easter tree is so beautiful with all the lace, paper and vintage things, and your soft pastel palette is so so pretty! 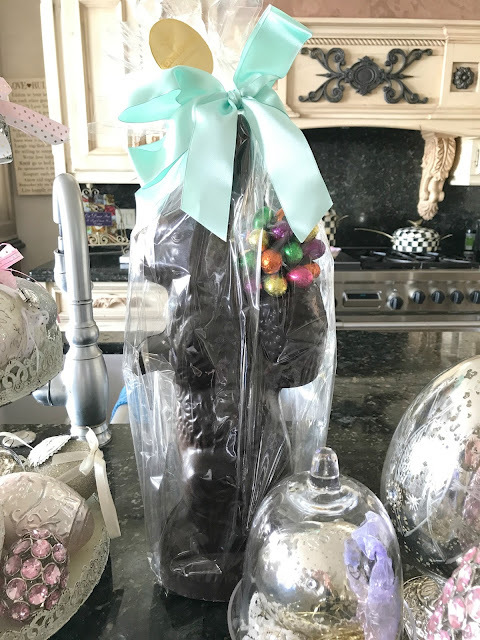 You are amazing to make your own chocolate bunnies, what a special treat! Making the chocolate bunnies is really pretty easy if you have good molds and good chocolate! 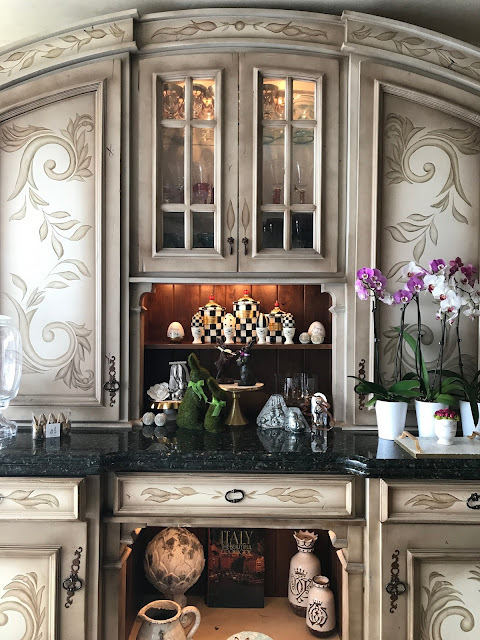 congrats again on creating such beautiful vignettes in your kitchen. The MKC looks fabulous and I do love those cute eggs. Your kitchen is such a showstopper. Always a pleasure to visit and see how you decorate for each holiday. 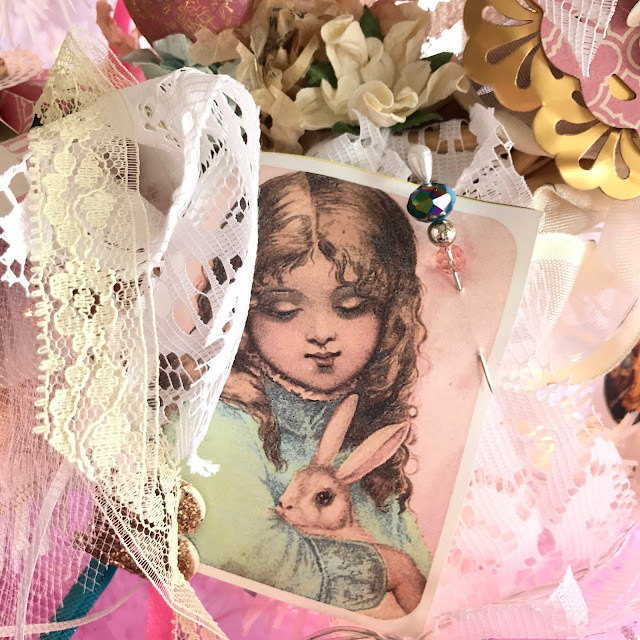 love the bunnies. pretty funny about your hubby wanting to eat the tall one. 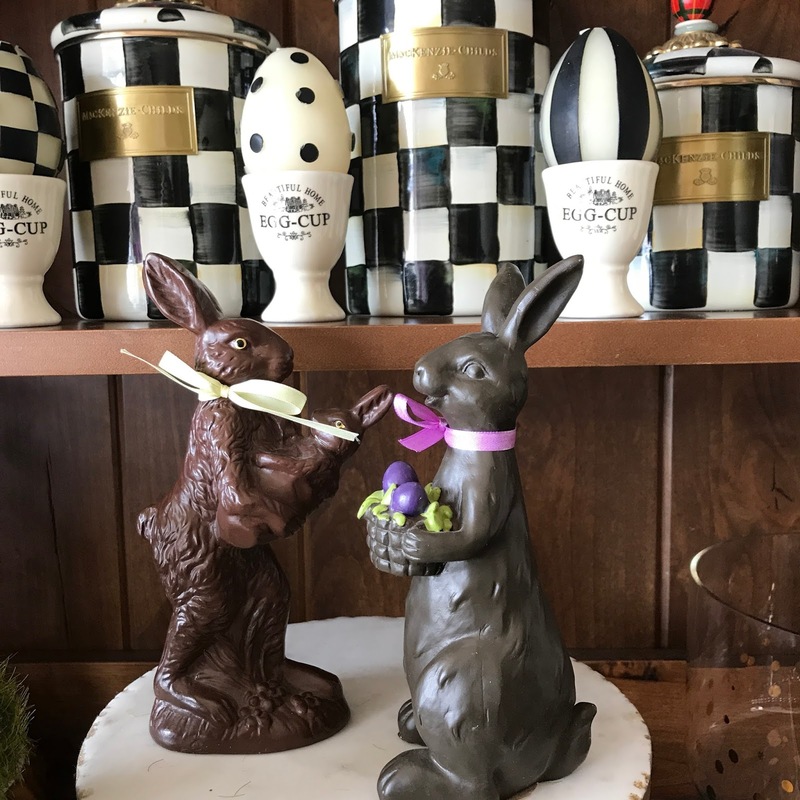 Yes, hope I can keep him away from that bunny, until it is too old to want to eat! I love how prettily your kitchen is decorated for Easter! 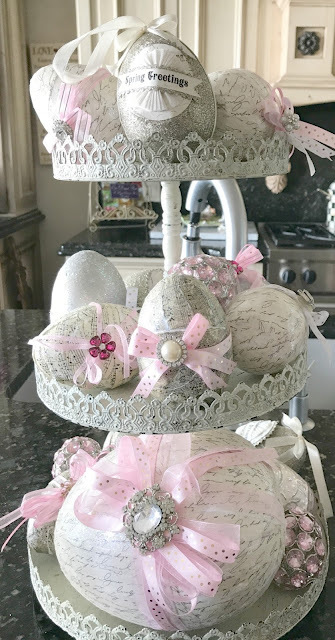 Your decoupaged eggs are gorgeous. 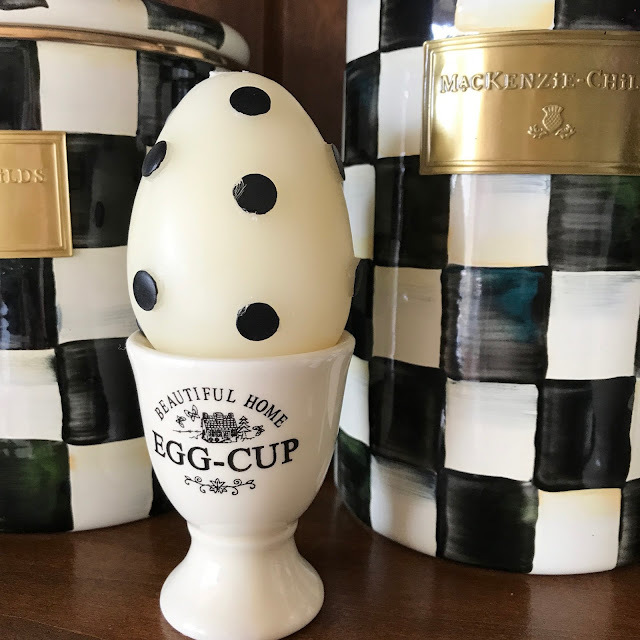 I didn't know that MacKenzie-Childs had egg candles! I love them! I found them at Home Goods this past year. You certainly have a special place to change every season/holiday!! 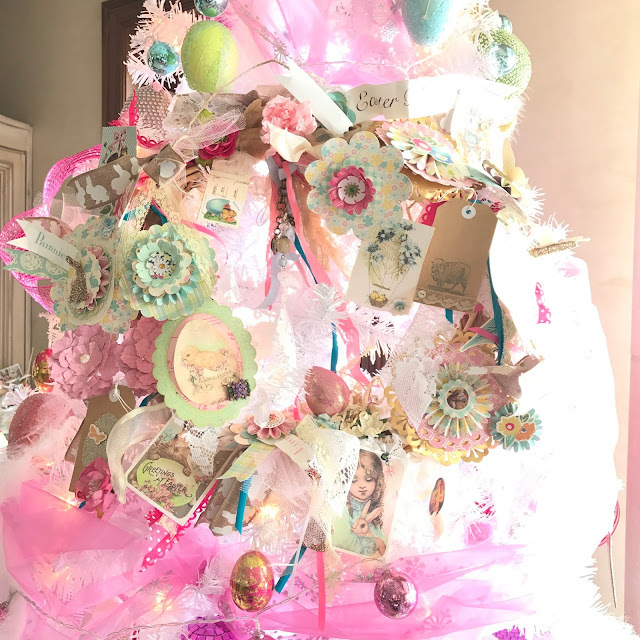 Pretty Easter tree! 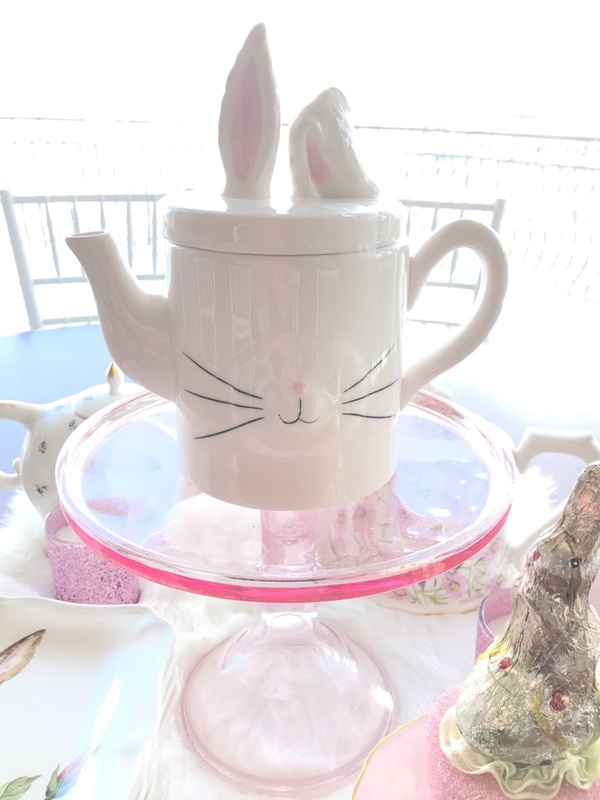 And that tea pot - adorbs!! 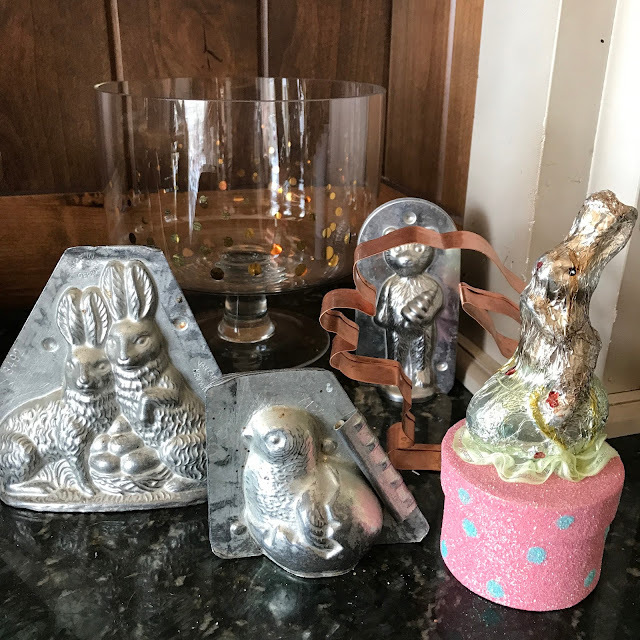 I guess I have to pull out a few bunnies and get in the spirit!! The space is competing with St. Patrick's Day! 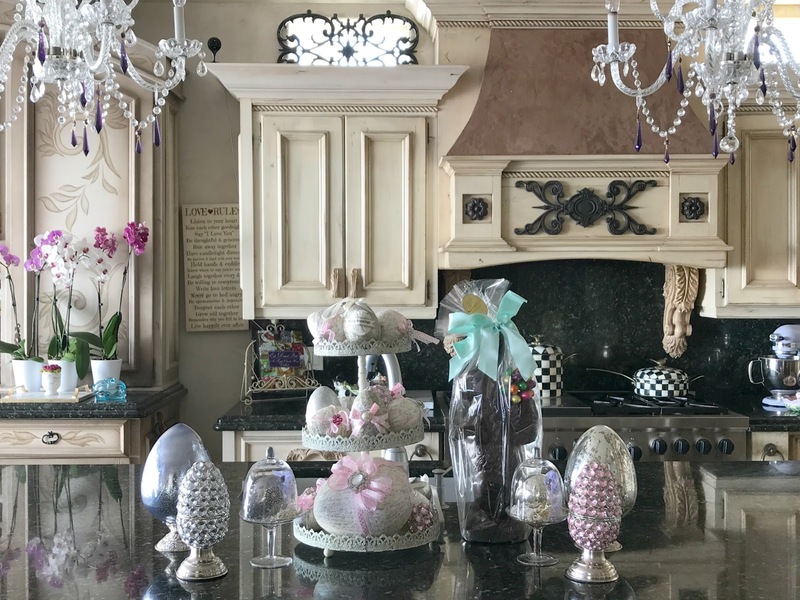 Jackie, what a great and happy kitchen you have, all ready for Easter! 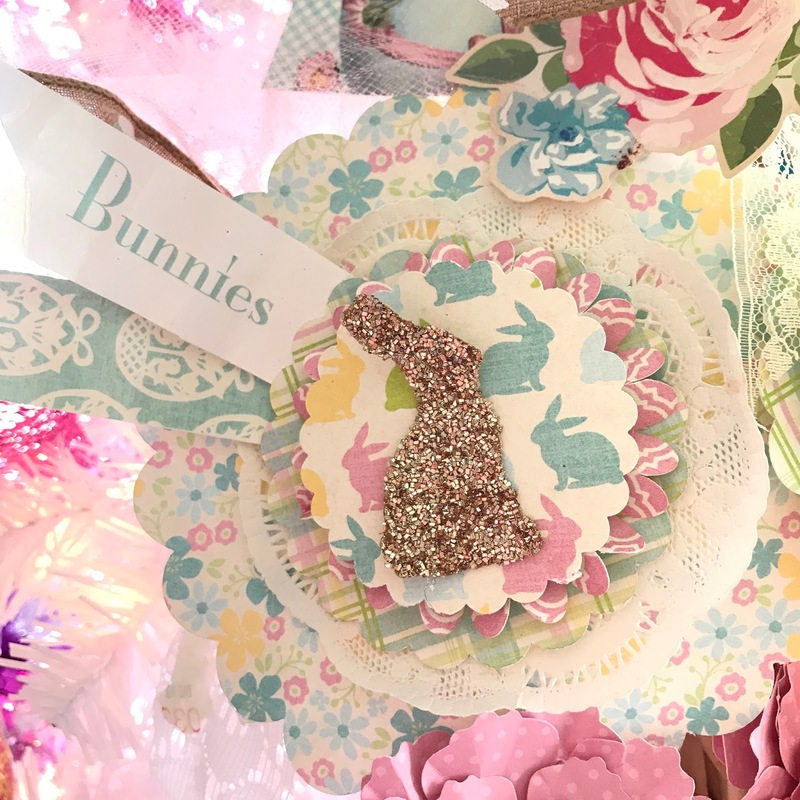 The bunny herd is just adorable. 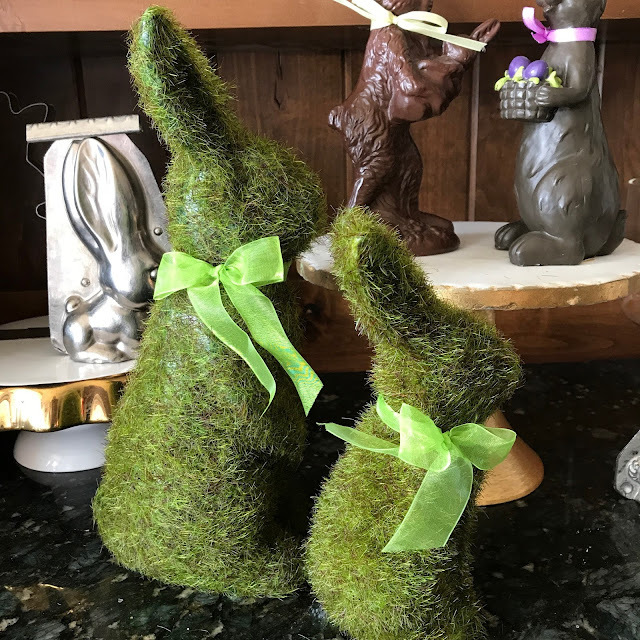 Every time I go to the grocery store I want to buy one of those mossy bunnies but have restrained - so far! 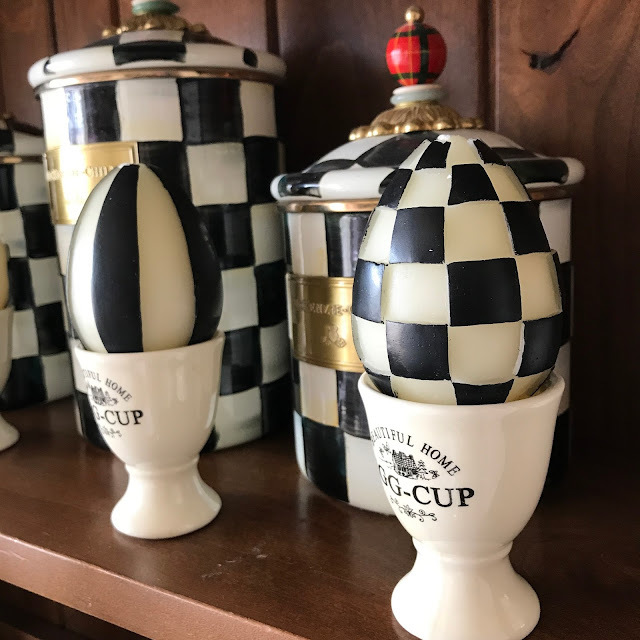 That pitcher is just adorable and, of course, I love all the MC eggs and other accessories. I bet it makes you smile each time you pass through that area. I know I would! I love the cute Easter chocolate molds next to the Easter chocolates! Adore all of the MK, too! 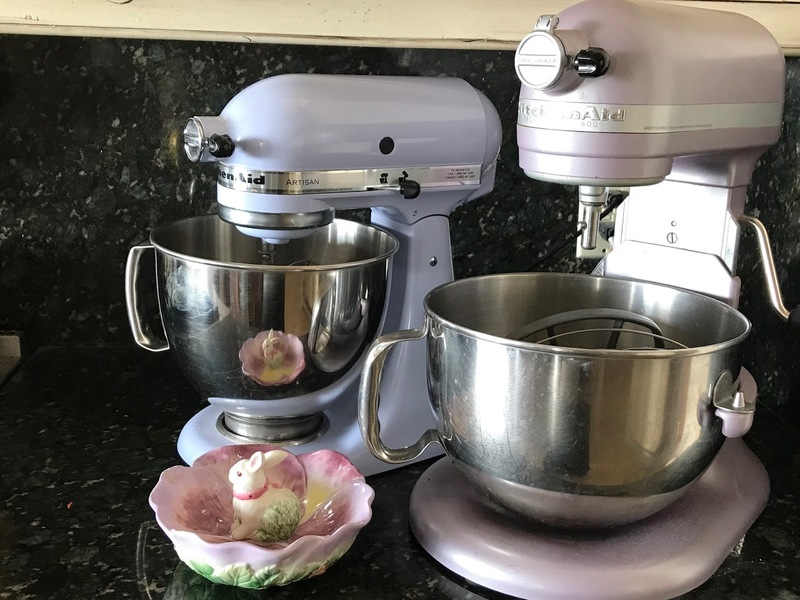 Also glad to see you have two kitchen aids, I have the big heavy duty one but sometimes if I want to make something small it is too big for that and I felt like I needed a smaller one too! 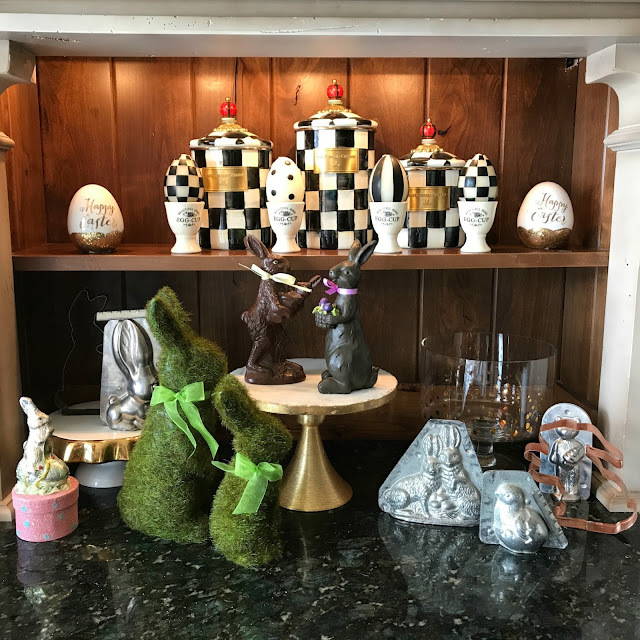 The Easter decorations look so good!! I love the black and white with it! !